Due to lack of time and lots of stress, I’m posting one of the most simple recipes known to man. 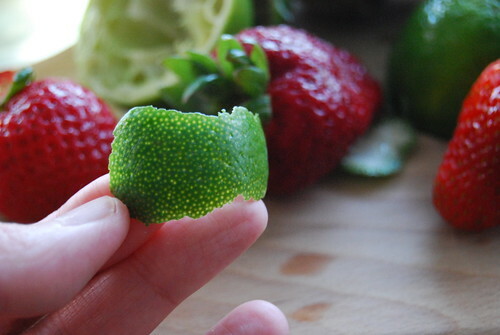 But it’s an ingredient that could mean the difference between a good limeade/lemonade to a great one: simple syrup. The basic ingredients for a basic ‘ade is your choice of lemons or limes, sugar and water, but the addition of simple syrup instead of sugar cuts down on the grittiness of undissolved sugar crystals. Simple syrup is equal parts of sugar and water heated for several minutes. That’s it! I can’t believe this stuff is sold in finer stores for mixed drinks but why buy it when you can make it yourself? To further infuse the simple syrup, I add a few pieces of citrus rind while the mixture is heating. I’ve been on a limeade kick lately — I keep a jug of lime-infused simple syrup in the refrigerator during the summer to mix up a quick batch. 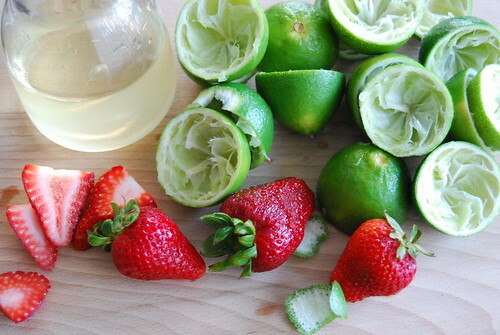 If I want to get fancy with my limeade, I sometimes add strawberries. Toldya it was simple! In a small pot heat everything until mixture starts to boil. Reduce heat and let simmer for 15 minutes. Remove from heat and store in refrigerator until ready for use. Simple syrup is a miracle worker. I usually make it straight, but when I go “all-fancy” I like to put in fresh ginger wheels while it simmers. Makes a great ginger setlzer base, or a rocking Moscow Mule. I bet now that you’ve said that, we’re going to start seeing “artisan” simple syrups in the stores for, like, $5 a bottle. And someone who doesn’t realize it’s just sugar and water will buy one and set it out proudly at their next party. I’ve added a vanilla bean to syrup before, and love adding ginger, but I’ve never tried citrus. Think I’ll give it a try this summer! Ooh, the rind is a great idea! I do the simple syrup for my iced tea as well, sometimes adding in honey.